ORID Is a specific facilitation framework that enables a focused conversation with a group of people in order to reach some point of agreement or clarify differences. It was developed by the Institute of Cultural Affairs (ICA) in Canada and involves a facilitator asking people four levels of questioning with each level building on previous levels. It's based on the theory that people need to be cognisant of the actual data and deal with their emotional responses to the topic in order to undertake better analysis and decision-making. ‘R’ stands for reflective – how people felt about the topic being evaluated. What they liked and disliked. ‘D’ stands for decisional – What is our decision or response. What are the main issues of concern to stakeholders and how might they be advanced? How might a strategy / programme/ project be improved? How can the tacit knowledge of a group of people be made explicit? Full list of advantages given on The Art of Focused Conversation (p21). The main essence is that this facilitation option, compared to the many other frameworks for facilitation, insists people consider all that is known (O) and their feelings (R) before considering issues and decisions, thereby ensuring the robustness of the issues (I) and decisions (D). It is a great way to get people talking constructively but there is always the risk of it turning into a festival of talk where everyone has a great time but not much results. What you have to think about and how you think about it depends on your role, whether you are a commissioner, a consultant being instructed to use an option or an evaluator who has to implement it. ORID is probably a good skill for a consultant to have. It could be a basic tool in their tool box and it can be applied in many different contextual situations. Managerial Challenge: Being sure the facilitator can deliver. Training Opportunities: Probably not necessary for commissioners to undertake full training in this option. The resources used in a group situation are the same as for any other workshop. The extra resource required is training in this option. If faced with using it for the first time explore some informal opportunities to practice it first. Just doing an ORID without using any other form of data collection will not provide sufficient evidence for Better Evaluation. It should be used in parallel with other evaluation options, as a way of bringing together data from a range of other options for group interpretation or other options can be used within an ORID to collect information. For example, in the ORID example given photo language was used to help gather information at the ‘R’ level. An ORID is best done with a facilitator who is trained in the technique. It doesn’t have to be an external paid facilitator, just someone who has an impartial viewpoint and is familiar with the option. Secondly, any one who has a vested interest in the project or programme will should be playing the role of valued participant, not facilitator. The facilitator does not need to be an evaluation person. The key to success from a commissioning perspective is in working with the facilitator to design the lead question at each of the four stages. A commissioner needs to check the qualification or experience of the facilitator in this technique. A quality ORID will be one where the transitions between the four stages is seamless and the participants are not aware of the rigour behind the facilitation. This option is open to being creative. Within the process, as long as robust information is sought from all four levels in the sequence prescribed any data collection technique can be used. Conversations can be a short as 20 minutes or range up to a whole day or perhaps even form the framework for an evaluation, depending on the information needed. A quality ORID will be one where the transitions between the four stages is seamless and the participants are not aware of the rigour behind the facilitation. Innovation: Keep abreast of innovations in facilitation – these may apply here. Methodological Challenge: Ensuring the option does not turn into a festival of talk and ensuring that the facilitation practices include the views of all, not just the dominant views of a few. That is where using photo language, or voting, and so on have a huge benefit – they encourage inclusiveness. Using this techniques within the option is a good strategy for beginners. It takes experience to be able to do it with just discussion. Quality Considerations: The temptation is to rush through the ‘O’ and the ‘R’. Don’t. ORID is a way of having a conversation that requires us to thoroughly explore what we know about something and what we feel and think about it before identifying issues and making decisions. This process ensures we get more reliable results from the option. 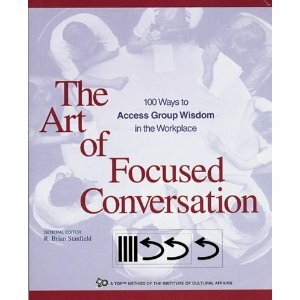 The Art of Focused Conversation: This book is intended to expand images of what can be accomplished through the Focused Conversation Method. It demonstrates how many workplace tasks can be accomplished through the medium of focused conversation. ORID and Strategic Questioning: This slideshow from L Carson of the University of Sydney outlines the key concepts involved in ORID and provides examples of what to do and what not to do when using strategic questioning.